[FnG] Nihilist wrote: I swapped the goalies but forgot to confirm...such is life. Ah, I see. Well, I feel better about that, then. Phew. [FnG] Nihilist wrote: Suarez gets a goal and an assist and 0 bonus? I mean, REALLY? Does seem a bit wacky... I guess they preferred Baines' goal and assist in that game? Demba Ba "doubtful" for Sunday vs LOLerpool. “It’s a little nerve in Demba’s shin,” Pardew says. No new word on Berbasmoke yet. Carlos Tevez — most transferred in striker atm... bandwagon, all aboard?! I transferred Tevez out because, regardless of what Mancini might say, he is going to end up sitting on the bench very soon. It's just the way Mancini's rotation policy is. Sooner or later, Tevez is going to end up getting subbed on at 71 minutes and score a cool 1 point, and it will have nothing to do with his current form. Too risky for me. Just broke the top 50,000 (45,216) - very happy with that! I doubt I'll manage to stay there, but hey...I'll enjoy it while it lasts. Kril is only 4 points behind me but almost 10,000 places lower! It's incredibly tight. 38,369th now overall I see, impressive! Anyway, I wonder if hazard will be kicking some more ballboys anytime soon. 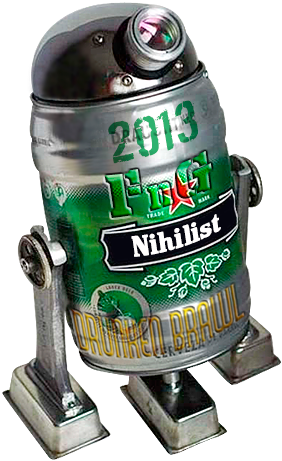 Final tables aren't up just yet, but it looks as if Mr. Nihilist has taken both the Fundesliga crown (going away) and the Drunken Brawl head-to-head championship. I thrashed about, trying desperately to catch up, but Nihilist's squad was just too good, built of solid picks. Along the way, I managed to break the 2,000 pts barrier, finally. So yay, somewhat. This off-esason and next season are going to be very new and different, what with ALL the managers of the top three EPL teams being replaced (Ferguson retired, Mancini sacked, and Rafa was always only interim). David Moyes is moving from Everton to take over Man United, but the other two spots aren't yet filled. Also, where does want-away striker Wayne Rooney end up? Wow, Nihilist is Mr. Double-Double-Back-to-Back Winner do0d! He took last year's Fundesliga and Drunken Brawl. Now he takes THIS year's Fundesliga and Drunken Brawl. Definitely a fantasy force to be reckoned with. Should be a tumultuous summer with lots of player and manager movement. Nicely played, everyone. Fun season! Congrats on breaking top 100k, Kril....85,285 to be precise. I was surprised how similar our teams ended up for a few weeks running up to the end - almost every time I made a transfer, you were bringing in the same guy! Lambert -> Sturridge for a 4 point hit in GW 38 is haunting me a bit. I didn't think he was going to play due to injury, so I took a hit to dump him. Not only does he play, but he scores and gets a BP while Studge did Jack Squat. Those 9 points I dropped as a result cost me almost 2,500 positions - I would have finished 12,898 if I had kept Lambert. Still, I can't complain too much - it has been a good year for the Losers! [FnG] Nihilist wrote: I was surprised how similar our teams ended up for a few weeks running up to the end - almost every time I made a transfer, you were bringing in the same guy! You were surprised — I was dismayed. Credit to you for doing the smartest* (*er, most similar to Kril) thing you could possibly do. [FnG] Nihilist wrote: Lambert -> Sturridge for a 4 point hit in GW 38 is haunting me a bit. I did Lukaku to Sturridge, which SHOULD mean I'm not allowed to play any more, owing to stupidity. [FnG] Da Kril wrote: I did Lukaku to Sturridge, which SHOULD mean I'm not allowed to play any more, owing to stupidity. Although in fairness, no one on earth would have predicted a Lukaku hat trick against Man United for Fergie's last game. Oops, almost didn't get the league turned on! Go here and register for free. Also, plop your team in FnG's Drunken Brawl – the head-to-head league. Lots of real-world manager and player movement are going to make this an interesting season, for sure. Also — kewl new Bonus Points system that may actually make sense! FIRST MATCHES ARE THIS SATURDAY, AUGUST 17, so get your team ready! [FnG] Nihilist has returned to defend his back-to-back titles! Good, I like a challenge. Go here and sign up for free. Build your team of super-footy-stars, then join our two leagues of doom. • Aston Villa and Chelsea have a double gameweek straight away, but be careful, they also don't play in GameWeek 3. • 11 guys will start for Mourinho's new Chelsea on Sunday, but who? I DON'T KNOW.